CNN - The Seventies - Episode 5 - The State of the Union is Not Good. As a reaction to the sugar-infused shows of the 60's, television in the 70's was radical, ground-breaking and experimental. Television got real.Viewing Guide with Answer Key. 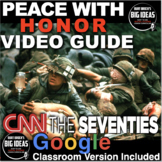 All episodes of CNN: The Seventies are available on Netflix and YouTube. CNN: The Seventies - What's Goin' On? This episode explores the music of the 1970s. Fun episode for students to watch. Viewing Guide with Answer Key. All episodes of CNN: The Seventies are available on Netflix. 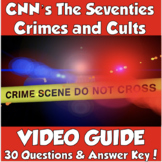 CNN - The Seventies: "The State of Our Union is Not Good"
What begins as a politically motivated "third-rate burglary" balloons into a history-making scandal that engulfs and overwhelms a presidency.Viewing Guide with Answer Key. All episodes of The Seventies are available on Netflix and YouTube. Viewing Guide with Answer Key. All episodes of CNN: The Seventies are available on Netflix. Could be used in a United States or World History course. CNN - The Seventies - Episode 8 - What's Going On?